Digital Picture Photo Frames: Great Gift or Worthless Rubbish? Millions of Digital Photo Frames are bought as gifts every year and Google Trends show that they’re especially popular around Christmas time, but how many get used … and how many sit there gathering dust in the gift recipients home/office? Most people like them but a vocal minority think they’re a frivolous gadget, worthless rubbish which uses up power 24/7, doesn’t show photos at their full resolution quality and is far more expensive than the cost of a traditional wooden/metal photo picture frame including the cost of printing the photo. The Australian consumer association Choice recently reviewed a number of digital photo frames and concluded that when they tested the first generation of frames the technology was new and raw – as evidenced by the low picture quality scores. Unfortunately, it would appear they haven’t improved much since. 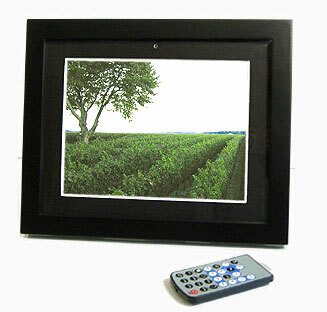 None of the LCD photo frames tested by Choice had image quality that matched a photolab printout and they all suffered from a reduction of image quality as you viewed them from above and below or either side. Digital picture frames are the worst gadget out there, tacky garbage that I can’t imagine anyone would ever buy. But they do! These companies are all putting them out because you people are buying them by the truckload! They’re essentially little flat-panel TVs with no tuners and a crappy frame wrapped around them. It’s official: you people have no taste. How else to explain that 20 million digital photo frames are expected to be sold in 2008? Yes, 20,000,000 digital photo frames, the red-headed stepchildren of the consumer electronics world, will soon adorn the walls of McMansions in every backwater suburb in the country. Let’s assume that the frame works as advertised, there’s a viewing angle question. I had an eStarling frame that had about a 10 degree viewing angle. Unless this thing was directly on my desk facing me, I could not place the frame in a convenient spot. Sometimes it’s nice to turn down the lights to watch a movie. Don’t forget to turn the frame off. Oh, that’s right, they need to be placed near an electrical outlet, so you will probably have another wire to wrangle. If you don’t want to waste electricity during the night, you’ll also have to turn off the frame. couldn’t quite get why people bought them meself but from what I’m hearing it sounds more like people buy them as presents for others than as something for themselves. I’d always go with the motto – if it’s not something you’d buy for yourself then why do you think it’s suitable as a gift for someone else when it comes to gadgets like these! We got one as a present about 8 month and I think it’s been on for all of 3 hours since. Mainly because I feel terrible turning it on because it seems like such a waste of electricity. I’m not a fan of the digital photo frames and I don’t want to buy one for my home. The reason why I don’t like them is I still like to have all my photos framed and displayed through the house and it’s another electrical appliance that I really don’t need! I got one for christmas last year – turned it on for about an hour when i first opened it and since then it’s sat up on my bookshelf and hasn’t been turned on. Apart from being a waste of power, I just think it looks **** with the cords hanging out of the back. As lots of you have said in here previously, photos that I display in frames are just like works of art to me. So, I’d say don’t bother. Spend the money on some nice frames and enlarge some of your digital photos to stick in there. Sometimes the simple things are the best. To be honest I am puzzled as to why people buy these digital picture frames. After all, for the price of them it would be far cheaper to buy a frame and put your chosen photo in it, and judging by the comments it would be a much clearer image. If/when you got tired of the photo you could just put another one in its place, simple. Thanks for confirming my suspicions. I certainly won’t be rushing out to buy one, not even as a gift! I agree with these comments and probably wouldn’t buy or use one myself. But I bought one as a gift for my grandparents for Christmas and they love it (once I wrote out clear and easy instructions on how to use it!). They love looking photos but they of course are static, this way we can update the flash drive every week with photos from family events and of great-grandchildren who live interstate. That way they don’t miss out on seeing the grandchildren/great-grandchildren grow and they don’t have to wait for digital photos to be printed out and sent to them through the post (cos really once you’ve taken the digital photo how often do they get printed?). They have it out in the back sunroom and turn it off at the wall when not viewing it so it doesn’t add major $$ to their energy bill. I guess with so many people buying I am not the only one who thinks they are great. I like the frames, personally. They hold a lot of photos, which saves money on pictures and frames. Plus, the images look great in a digital slide show. I agree with these comments and probably wouldn’t buy or use one myself. But I bought one as a gift for my grandparents for Christmas and they love it (once I wrote out clear and easy instructions on how to use it!). IMO those digital picture frames are dumb, im all about real pics and photography. Yea I do own a point a shot camera and a SLR but i always print them out on my photo printer =). They make easy and great gifts. They hold a lot of photos,this way we can update the flash drive every week with photos from family events and of great-grandchildren who live interstate. They may seem like a waste of money/space, but think how much space you will be SAVING by not having countless boxes of photos clogging up your wardrobe! I don’t own one and to be honest don’t need one as I’m happy displaying my images on the PC, via Flickr or whatever. But this is one of those cases where a new technology (ie digital cameras) has wiped out the old way (ie wastefully printing your pictures on paper, be they good or bad) and people haven’t caught up with how they will store, “display” and share what they have taken. Over time it will sort itself out, but in the meantime we get analogs of the old way, like these frames. I suspect the long-term answer will be to display your jpegs using a screen saver on your TV, or maybe even on your refrigerator… who knows. And yes, we have to find away to do it using sustainable energy sources. But even today you can pick up a wind turbine or solar panel from Jaycar or wherever and balance the equation, if you want. In any case the common alternative is to print the image, at high quality, on high quality paper, using an elaborately transformed good known as the home printer and assemble it into a frame (that in itself was made from something at x cost). Add the energy and resource cost of doing all that (and safely disposing the leftover chemicals and the printer itself when it expires, too) just once and then imagine changing that image every (let’s say) month. Over 10 years your “printed image” cost is.. ? We should do that comparison with the digital frame, whilst realising the digital method displays far more images at tiny marginal costs. In that way it’s probably not as bad as it seems, either for our pockets or the environment. We just need to crunch the numbers. We bought my grandparents a digital photo frame for Christmas this last year. We passed a camera around during the family Christmas party. I took it and made sure to include myself in over 100 of the photos. They had a good laugh when they noticed what I’d done. These frames are awesome.